Perch it outside to play tunes at backyard barbecues or during your morning gardening. What if the birds in your yard could sing, well, The Yardbirds? 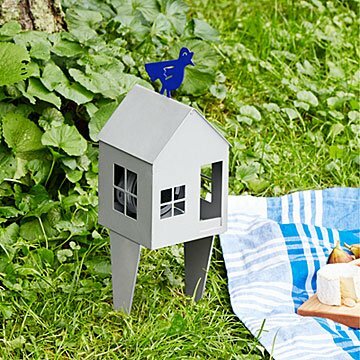 This little songbird brings your favorite tunes to backyard barbecues, cocktails on the patio, or even your morning gardening: just connect to the wireless speaker in its house and start your favorite playlist. Perch it in the grass or set on a table— the speaker's reach is about 33 feet and its charge lasts about six hours. Choose from either a vibrant yellow or brilliant blue bird. Designed by Randy Smithey . Made from weather-resistant powder-coated steel in Nebraska. Artist and designer Randy Smithey draws inspiration from his exploration of the natural world. His appreciation for birds, in particular, has led him to create many sculptures and products featuring these winged wonders. A native of the Pacific Northwest, he currently lives and works in Oregon where he and his wife share studio space. Includes USB charging cord, does not include USB power adapter. Speaker can be unscrewed from birdhouse wall.